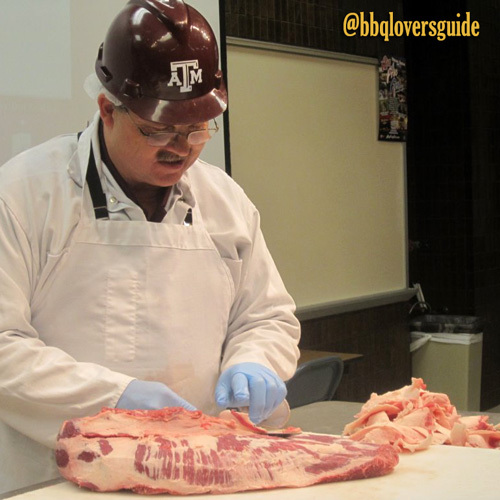 Foodways Texas offered the first two day Brisket Camp at Texas A & M in January. The word on the street is these classes are very popular and sell out quickly. All true. If you’re lucky and sign up in the first couple days of registration you can get in. I think it’s limited to 50 people. It’s well worth the fee of $500.00. Marvin Bendele, the Executive Director of Foodways Texas, coordinated the event. He is a razor sharp organizer who sticks to a time line arranging interesting speakers and demos in non-stop sessions. Except to eat, of course. Then it was all brisket – all meals brisket and more brisket. Some of the briskets were experiments; some were cooked by the staff at the university and some were catered by Southside Market and Barbecue and Fargo’s Pit BBQ, a Daniel Vaughn’s favorite. Dr. Jeff Savell and Dr. Davey Griffin, two first class professors, taught the class along with a huge agenda of professionals. Discussions of, Anatomy of a Brisket, Beef Grading and Certified Beef, Knife Selection and Slicing and Carving, The Science Behind Barbecue, Wood and Smoke, Barbecue Pit Design and Maintenance, Building a Good Fire and one of my favorites, Should I Wrap or Not Wrap? We had panels with pros, Greg Gatlin of Gatlin’s BBQ in Houston Justin Fourton of Pecan Lodge in Dallas Bryan Bracewell of Southside Market & Barbecue in Elgin, and Scott Morales of Taylor Café in Taylor. I loved being able to ask questions of the panel and also hearing other attendee’s questions. Some very interesting conversations ensued. Barbecue in Texas is such a passionate topic and truly everyone has their own personal opinion. We also got a history lesson from well-known author Rob Walsh. His book Legends of Texas BBQ is a fun read. He just published a new book that takes him into southern BBQ. I look forward to adding it to my growing list of Barbecue books. So what did I learn? Just about everything anyone could want to know about smoking or cooking a brisket. Should you brine the meat? Not in Texas. Do I only need to use salt, pepper and paprika? Yep. Can I ask the butcher for a small brisket? No – get a vacuumed packed “Packer’s Cut” 12 to 13 pounds. Always use USAD Prime or Choice; the yield on brisket is 50 percent. Temperature is key – Low, slow and steady is recommend as was the Bluetooth compatible meat thermometer. I learned more tips that I’ll be passing along. Stay tuned. This entry was posted in Events, Travel and tagged bbq, education, foodways, technology, texas by Gloria Corral. Bookmark the permalink. Wow, that sounded like one hell of an event and I’m sure the food was great! It's National BBQ Month - so what's BBQ?